The 13th Annual London SA Wine Auction, in aid of Jan Kriel School took place on Thursday, 19 May at the Plaisterer’s Hall, London. More than £35,000 (Thirty Five Thousand Pounds) was raised for the learners of Jan Kriel School; a school for children with learning disabilities. The Jan Kriel London Wine Auction was established in 1998 as a brainchild of Dave Hughes to create not only awareness of the top South African Wines, but also to raise much needed funds for Jan Kriel School. Throughout the years the auction grew and the name was changed. 4000 - a new record. which make it impossible for them to attend mainstream schools. This year 550 learners enrolled and the Head Boy, Mathew Hardie and Head Girl, Lize Loubser represented their school in London, at the event. 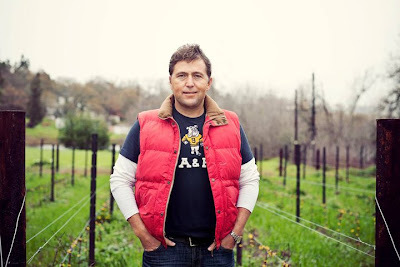 The 14th Annual London SA Wine Auction will coincide with Jan Kriel School’s 75th Birthday celebration in 2012. 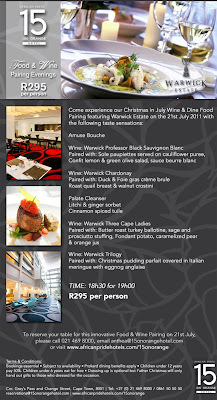 The auction will take place on Thursday, 24 May 2012. 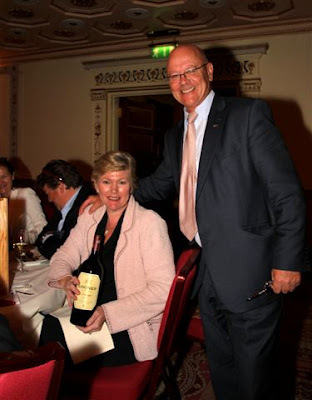 Johann Krige (Kanonkop Estate) congratulates successful bidder, Julia Hands on her 9ℓ Kanonkop Pinotage, 2009 that was auctioned for £1,600.00. Johann opened a 1.5ℓ Kanonkop Pinotage, 2009 at her table to enjoy during the evening. 2 Nights only - Don't miss out - Book now! 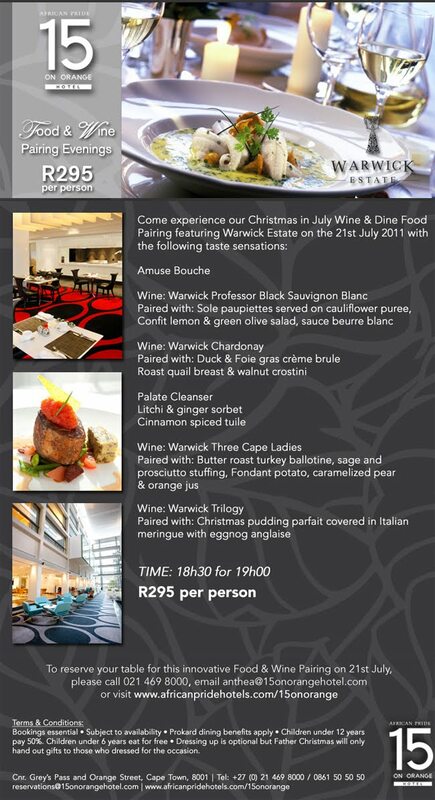 Book your seats now for Warwick Christmas in July!